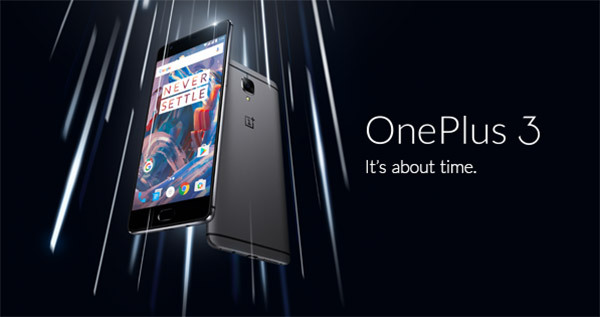 With lot of leaks and talk OnePlus has finally launched its flagship device OnePlus 3 on Tuesday. The company's fourth smartphone is priced at Rs. 27,999 in India, and while it was scheduled to be available at 12:30am IST via Amazon India, it is already available with a 'lightning deal'. As reported earlier, OnePlus has killed the invite system for the device, it is expected that limited stock might be available at the launch. In the US, the OnePlus 3 has been priced at $399 (roughly Rs. 26,800), while it will be available at CAD 519 (roughly Rs. 26,300) in Canada, EUR 399 (roughly Rs. 30,200) in select EU regions, GBP 309 (roughly Rs. 29,500) in the United Kingdom, and HKD 3,098 (roughly Rs. 26,900) in Hong Kong. Those who have watched the launch of device will be able to buy the device ahead of their country launch, OnePlus will send them a email containing a link to complete the order. As far as design is concerned OnePlus 3 will be available in a Graphite colour variant, while a Soft Gold variant will be made available at a later date. It features a metal unibody using 'space-grade aluminium alloy', and is 7.35mm thick. The OnePlus 3 measures 152.7x74.7x7.35mm, and weighs at 158 grams. OnePlus 3 is powered with 16-megapixel rear camera with a Sony IMX298 sensor, an f/2.0 aperture, OIS and EIS, and PDAF autofocus, apart from RAW image support, 4K video recording support, and a Smile Capture mode. The front camera bears a Sony IMX179 sensor, an f/2.0 aperture on the fixed focus lens, and benefits from EIS. It can also handle 1080p video recording. As per expactaions company has not launched the second variant of device. The device is powered with 3000mAh non-removable battery and comes with Dash Charge adapter alongside, which uses the company's fast charging technology to charge the battery up to 60 percent in 30 minutes. The device is well equiped with 5.5-inch display size and full-HD resolution (401ppi) of its predecessors, but this time it also bears an Optic Amoled display with Gorilla Glass 4 protection. The dual sim (both nano sim) device is running Android 6.0.1 Marshmallow. The indian buyers will get a free 12-month subscription to Saavn Pro, and can avail a "double data" offer from Idea Cellular for 12 months. They can also avail 12 months accidental damage coverage through the 'OnePlus Care app' powered by Servify. According to us device is little bit over priced but still a flagship killer. Do share your views in comments section about the device.